VSTM Verastem Inc (NASDAQ: VSTM) stock price has created a strong bullish break in the weekly time frame. The break comes in line with the recent announcement on Wednesday the 6th 09/17 relating to their progressing treatment for Leukemia which sky rocked the stock 44% higher. Wednesday’s catalyst for the rally is the positive top-line data from the Pivot Phase 3 DUO study for the treatment of certain types of Leukemia and Lymphoma. Verastem said its drug, Duvelisib, reduced the risk of disease progression or death in patients by 48 percent when compared with the current standard of care, Novartis’s Arzerra. The oral drug was tested in 319 patients suffering from chronic lymphocytic leukemia (CLL) or small lymphocytic lymphoma (SLL), who did not respond to initial treatment or whose cancer had relapsed. CLL and SLL affect cells in the immune system, causing them to grow and multiply uncontrollably. There will be about 62,000 new cases of leukemia in the United States this year; of which CLL will account for about a quarter, according to the American Cancer Society. Verastem said it would file for a marketing application for duvelisib in the first half of 2018. The study results were “squarely positive,” and suggested a commercial opportunity that was not fully reflected in Verastem’s stock price, Cantor Fitzgerald analyst Mara Goldstein said in a client note. Before we get into more details about the Stock, few words about the company. According the company’s official website www.verastem.com, Verastem Inc. (NASDAQ: VSTM) is a clinical stage biopharmaceutical company focused on discovering and developing drugs which improve patients with cancer (source : www.top10pharma.net). Verastem’s product candidates seek to treat cancer by targeting malignant cells both directly and through modulation of the tumor microenvironment. Our most advanced programs target the phosphoinositide-3-kinase (PI3K) and Focal Adhesion Kinase (FAK) pathways. (NASDAQ: VSTM) Verastem Inc. stock price broke the multi year bearish trend line the 07/10/2017; suggesting that the 07/08/2013 cycle from the all time highs of 18.70’s has been completed at the 1.05 lows. As we all know, after a trend line break, a retest follows to validate the move. The VSTM Stock price retraced lower after the break higher to retest the broken trend line. Price failed to extend below the 2.99 level and from there the stock extend higher. Recently, price broke one more important barrier, the larger degree descending channel’s median line adding additional strength to the overall bias. At this stage; we anticipate a short term pull back to retest the median line around the 4.84 area. The (NASDAQ: VSTM) Verastem Inc. stock at the Daily time frame has inline a bullish incomplete sequence from the 1.03 lows. At the time of conducting the study, price is trading at the 5.24 level. That level is the 61.8% – 76.4% Fibonacci extension of the (W) – (X) blue swings. From around current levels, we want to see the short term correction lower. The correction should mark wave B (red) and ideally retrace to the 4.80’s area. 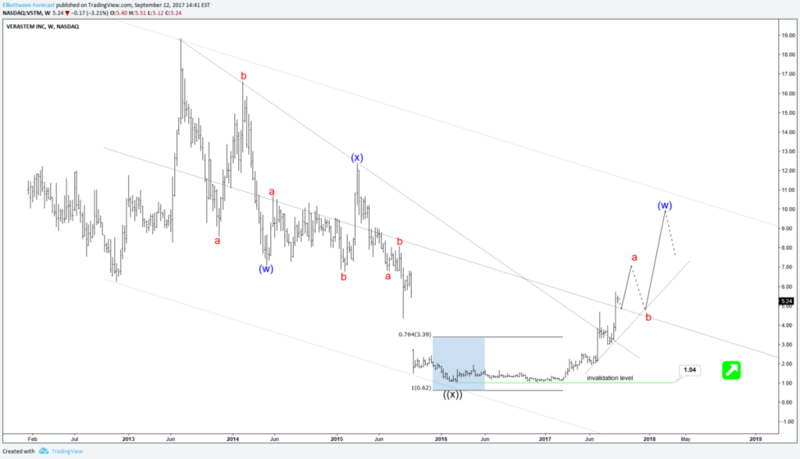 Post completion, we expect an extension higher towards our target at the equal legs – 1.236% extension, around the 6.60’s – 7.50’s zone. Our view favors the (NASDAQ: VSTM) Verastem Inc. Stock higher and recommends; Long Trades post Short Term 3-Swing Pull Backs. 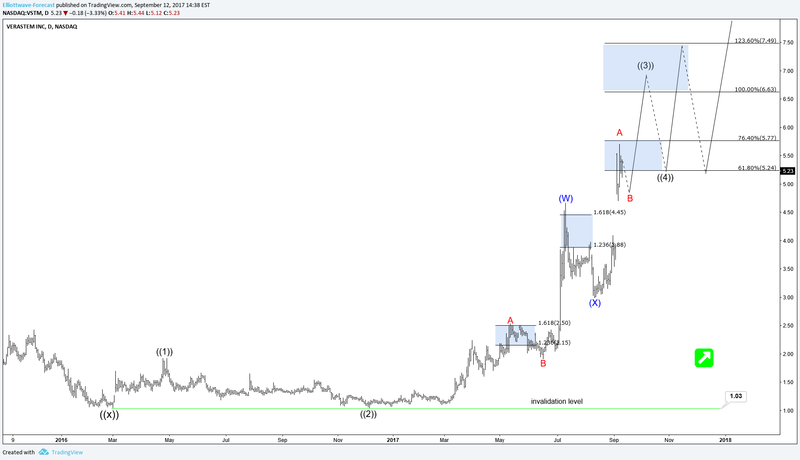 Wave B should unfold in 3, 7 or 11 swings against first degree the 2.99 “(X) blue” and second degree the all time lows at the 1.03 invalidation level. 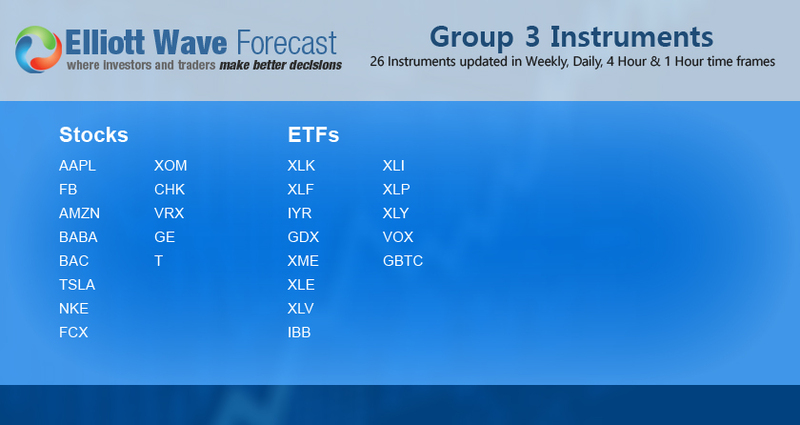 If you have found our analysis interesting, or would like to fine tune the trade in the lesser degree time frames we are almost certain you will enjoy our new plan covering 13 Stocks & 13 ETFs. We provide Daily Technical Analysis in the Weekly, Daily, 4 Hours and Hourly time frame. Trading opportunities, Live Sessions and many more.